Coming across a genealogy or family history that mentions your family is an exciting thing. A published genealogy often gathers information from many sources. And, some of these sources may no longer be available or would be extremely difficult to find. 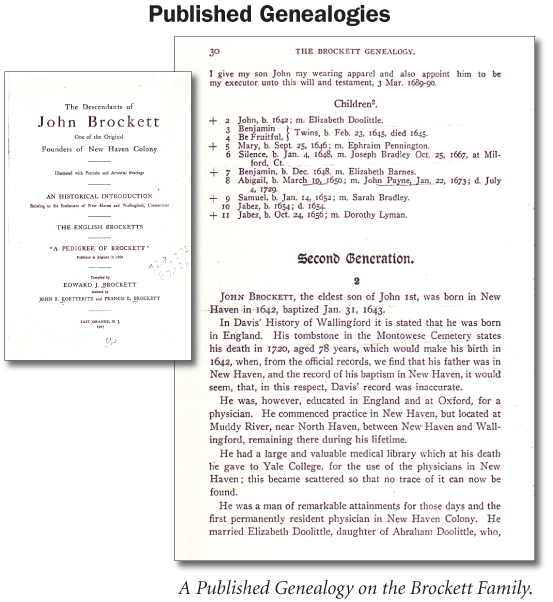 Genealogical collections usually give information about families for several generations, and include: the names, and birth, marriage, and death dates and places for the husband and wife, the children, and possibly siblings and parents. However, you need to carefully evaluate each one you find. Check to see if it’s well-documented—or even documented at all. Use caution and verify the data with other sources—primary ones if they exist. Many genealogies have been erroneously compiled because previous researchers relied exclusively upon erroneous material they found somewhere else in print. Many published genealogies are out of print and few libraries offer them on interlibrary loan. 1) Family History Library — in the FHL Catalog do a “Subject” search using your ancestor’s surname to see if there are any published genealogies available.